All Americans should want to come to Tirana. And why not? 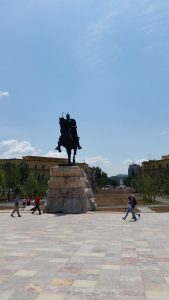 Recently Tirana has grown into a modern city and it is probably one of the safest places for an American, owing to the great love Albanians cherish for the USA. All US officials or diplomats that work and live in the Albanian capital are almost sad when they leave the country. Not only because of what is mentioned above or the good, cheap food or weather; but mostly because no other city can give faster popularity and reputation to a foreigner, especially Americans. In Tirana, the USA is considered as God himself and everything they say is taken for granted. Many world newspapers have highlighted the Albanian capital recently, even drawing the attention of the prestigious British “The Guardian” and the well-known American “Lonely Planet” and “Vogue”. The French newspaper “Le Figaro” recently considered the city’s transformation a real revolution. 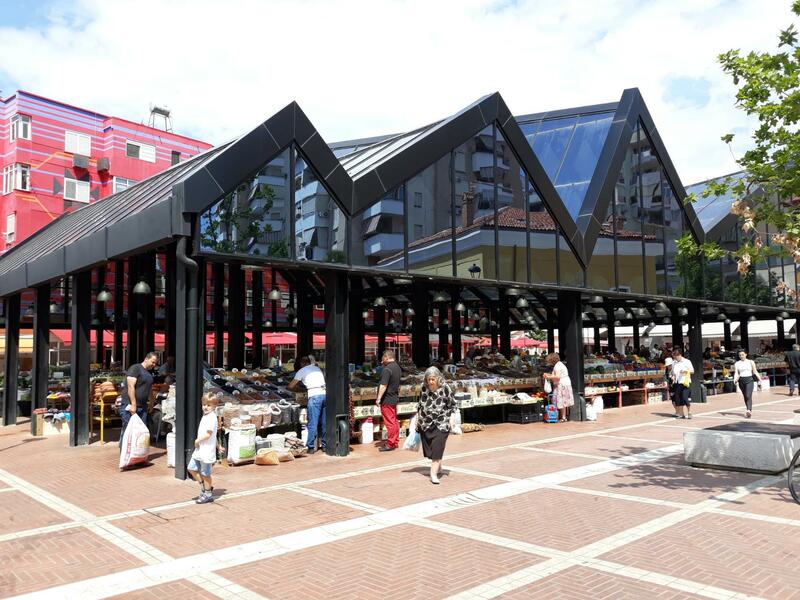 Successful projects, like the transformation of Scanderbeg Square, from a traffic roundabout into a walking area, the renovation of the New Bazaar from a dirty place into a traditional market, and the investments made in the Big Lake Park to turn it into a recreation area for everyone. Le Figaro appraises Tirana Mayor Erion Veliaj, the 38-year-old hardworking, tenacious and modern Head of the municipality, made possible all this. 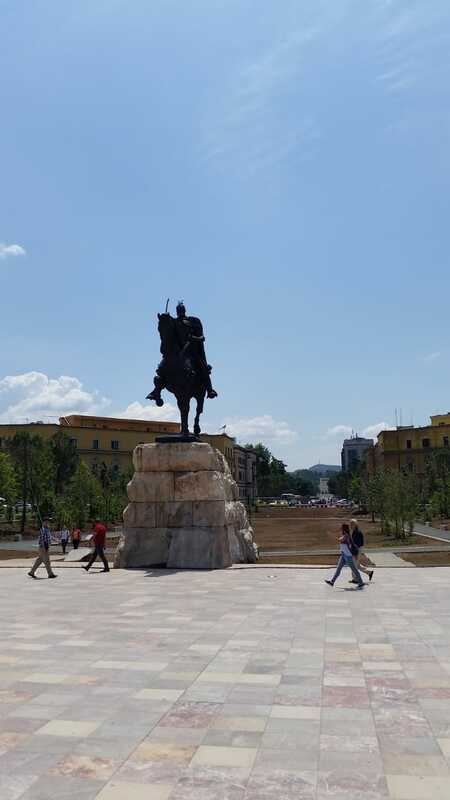 Dressed in jeans, he rides on his bicycle to the office or around the city, greeted warmly by Tirana citizens. His cooperation with West European municipalities, for sure will bring better changes to the capital. The biggest Dutch newspaper “De Telegraaf” has also produced a long article on the Albanian capital city, calling it the most modern city in the Balkans. It points out the colourful buildings, the relaxing atmosphere of trendy cafes and restaurants, the pedestrian areas around the centre and the bustling nightlife in the Block, the former communist leaders’ residential area. Tirana is a new city. It started to develop last century in the 1930s by Italian entrepreneurs. 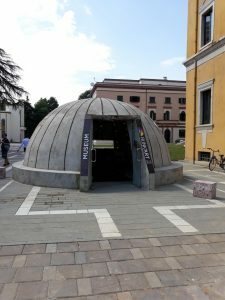 Well-known Italian architects and engineers, like Gerario Basio, Florestano di Fausto, Gulio Berte, etc., changed the Albanian capital from a feudal place to a modern one. The design and construction of the Bank, the line of ministries on the main boulevard, ending with the state university and the national stadium that are still preserved with little change, represent a part of Tirana’s history. During the communist period, Tirana continued to grow. New residential buildings were constructed on both sides of the Lana River that runs in the centre of the city. 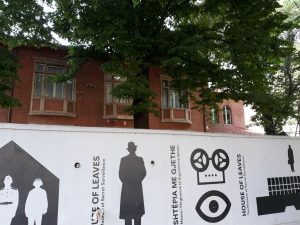 With the passing of years, Tirana grew. New neighbourhoods were added and all buildings were raised up to five floors to fit with the historical area. Many plants and factories were set up in the suburbs. There were a lot of green areas and there was no air pollution, as people did not own cars. In 1990, there were nearly 300,000 inhabitants in the Albanian capital. But the biggest changes happened after the 1990s; unfortunately, it was a deteriorating period. 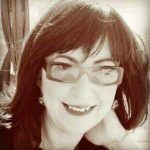 People from all corners of Albania migrated to Tirana for a better life. They settled in the suburbs, occupying land and building houses without criteria. More people also settled in the city at the time when the construction business was experiencing a real boom, during 1993-2005. With no infrastructure plan, tall buildings were constructed everywhere, destroying what Tirana represented until then. The population tripled, the air pollution increased, and the green areas decreased. The traffic skyrocketed, making life for everyone less pleasant. However, in the last five years, it seems Tirana has started to breathe again. Good changes have happened and all this is attributed to the current mayor, whose farsightedness and hard work is very much appreciated. Though traffic still remains the main cause of air pollution, the friendly way Albanians welcome tourists, the low prices, good food, and good weather make up for it. 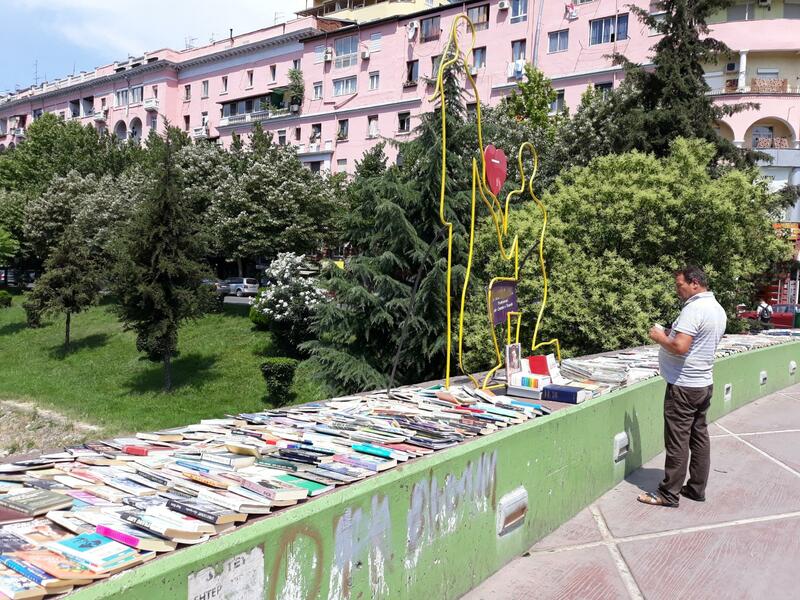 Tourists are of course curious to know more about the history of Albania during its 50 years of communist rule. 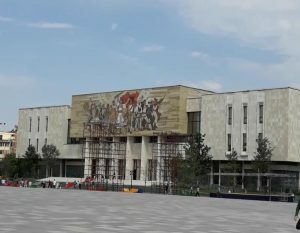 Besides visiting the National Museum in Scanderbeg Square, which provides data on Albania’s ancestors, the Illyrians, during the Roman Empire, the legendary period of George Scanderbeg, the national hero that fought against Turks and shielded Western Europe from invasion, Albania during the Renaissance time and during the two World Wars, and then the socialist period. There are other museums not to be missed, connected to the communist past – BunkArt 1 and BunkArt 2. The first is situated in the suburbs of the city, on the foot of Dajti mountain. It is built within an atomic bunker used by the former dictator Hoxha. BunkArt 2 is right in the city centre. 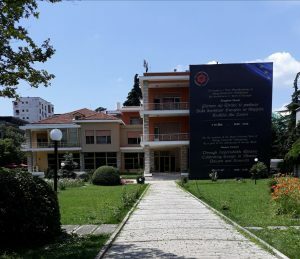 It is a unique Albanian museum, inside another preserved communist-era nuclear pit bunker. 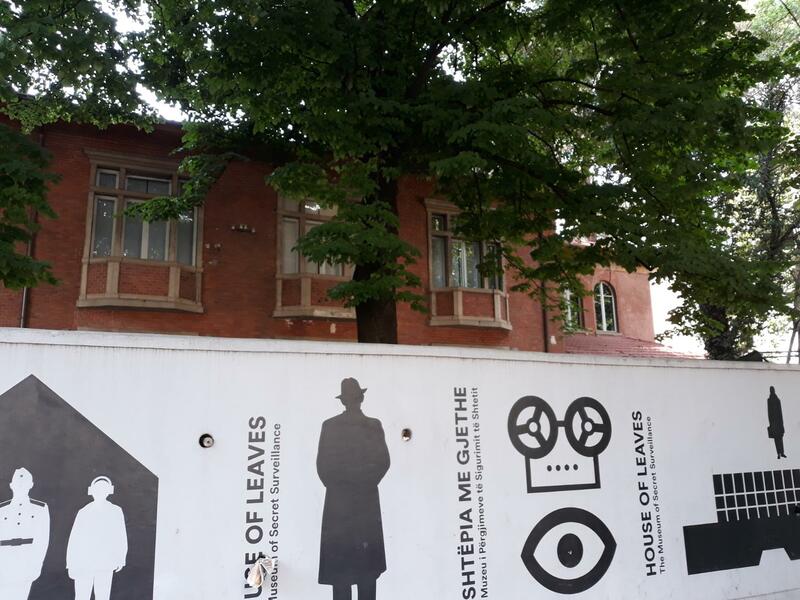 Then, there is the House of Leaves museum that provides facts of the secret surveillance during that period. 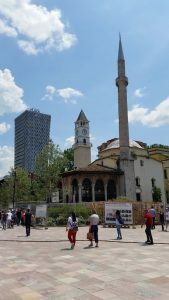 Foreigners are also curios how four different religions live in harmony in Albania – Muslim, Catholic, Orthodox and Bektashi. They can visit a number of mosques, cathedrals, churches and tekkes that are mostly settled around the city centre. Tourists can also stroll round the renovated Scanderbeg Square, surrounded by the Opera House, Tirana International Hotel, National Museum, Bank of Albania, the bust of Scanderbeg on horse, and the clock tower next to Ethem Beu Mosque, the oldest in the city. There is a pedestrian street quite nearby, with small cafeterias and ruins of an old castle, a big shopping mall “Toptani” next to Plazza Hotel. Less than a kilometre from the square, there is the New Bazaar, the open market of fresh fruit and vegetables and fish shops. A lot of characteristic bars and restaurants surround the place. After crossing Lana River, there is the Block, the favourite area for almost everyone, especially young people, full of bars and restaurants, with a busy nightlife. All the residences of former communist leaders have been turned into bars, restaurants, night clubs, hotels and fashionable shops. There you can find good food, mostly Italian cuisine, the latest extravagant fashion and beautiful girls. For more recreation, tourists choose to take a walk by the artificial lake that can offer freshness and relaxation. There is an Aquadrom there too, with swimming pools and games. Or they can climb Dajti mountain by cable car and have a view of Tirana from the top. The winter is not cold in Tirana, but on top of Dajti there is mostly snow, good entertainment for those who prefer it. In the summer you can enjoy horse riding, fresh air and greenness. Tirana offers everything in every season. The sea is only 35 km far from the capital. 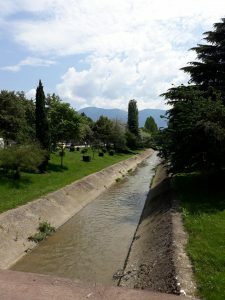 The surroundings of the city provide good traditional food with numerous farms, and also tourist attractions, like small castles, small lakes, rivers, caves and waterfalls. Rinas International Airport is only 20 minutes by car. There are buses or taxis from the airport to the city that are quite cheap. Tirana is a safe city. You can go out any time without getting worried that something bad might happen. Almost everyone knows a little English, so you will never get lost. If you plan to come to Tirana this summer, don’t forget to bring with you a cap, sandals, shorts and T-shirt and put on sunscreen 30. And your smile… You will take dozens back. Be convinced that everyone will love it…and not just Americans.